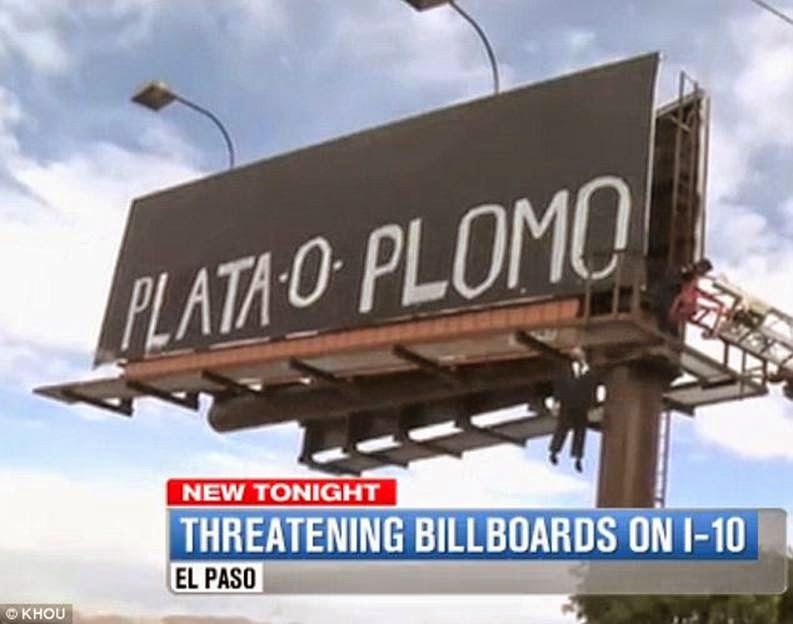 Two frightening incidents of vandalism in El Paso near the Mexican border in Texas have been interpreted as warnings from drug cartels. 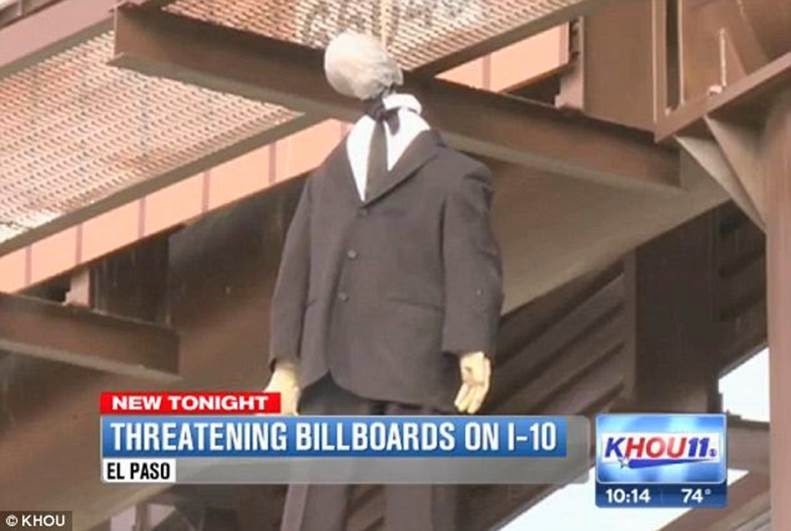 In both instances, a mannequin wearing a suit and tie was tied to a billboard with a noose and messages were scrawled over the placards. Local station KHOU reports that one of the signs reads 'Plata o Plombo' which translates to 'silver or lead', a threat used commonly against police officers effectively warning that if they do not accept the cartel's bribes then they will be shot. 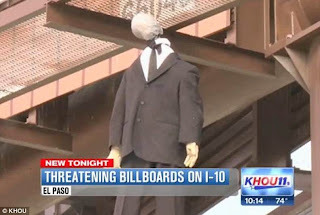 'This symbol has historically been used by Mexican drug cartels to threaten or intimidate Mexican citizens, business owners and government officials; however, we have never experienced this in El Paso,' local police said in a press release about the vandalism. 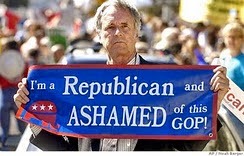 The fear now for many is that the 'warnings' shows that the drug cartels- which have not been identified by name- are willing to bring the violence from Mexican border towns into Texas. 'Maybe the problems in Juarez are coming over here,' El Paso resident Javier Padilla told KHOU. Mr Padilla and his wife Maria Ramos know the terror of drug cartels on a personal level after two relatives were murdered in the area of Juarez in 2009. 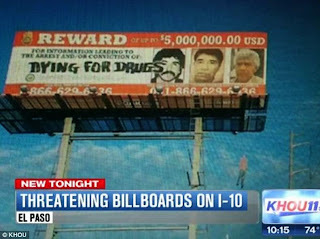 The second instance of vandalism had a more obtuse warning, but the theme ran through since the message was written on an existing Drug Enforcement Agency billboard. 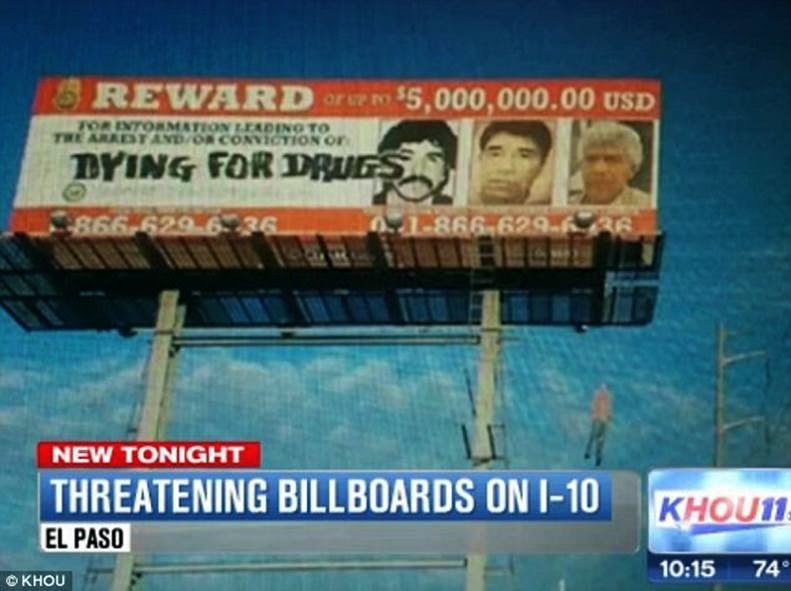 The message was different this time, as the paint read: 'Dying for drugs' was written over a wanted poster calling for the capture of drug lord Rafael Caro Quintero. This second mannequin was dressed in jeans rather than the suit and tie from the other instance. The mannequins were a particularly jarring image for many familiar with the drug war, as some of the most violent drug lords south of the border regularly hang offenders off highway overpasses. While a warning from drug lords seems like one of the most likely prospects, KHOU reports that prosecutors have another theory that the vandalism also could have been caused by activist groups working against the war on drugs.